In the professional work I do, I see a number of families who have spent a great deal of money on educational testing, in an attempt to understand why their very bright child is not reading at a higher grade level. So very often, the test reports I read make the same recommendation: Follow up with a pediatric optometrist for Convergence Insufficiency. The families are looking for a second opinion because they’re not convinced expensive vision therapy is the best answer. Convergence Insufficiency is a medical condition where a person’s eyes do not work together to focus on something close up, such as a book or a computer screen. To understand how CI works, think of what it feels like to look through a pair of binoculars. The binoculars force both of your eyes to center in on the same magnified spot at the end of your nose so you can look at an object in detail. For someone with CI, their binocular vision does not work correctly. One eye will wander off in a different direction when they try to read something up close. This inability to stay focused may cause double vision, headaches, or squinting. The medical and vision fields know that CI exists and that it can effect a person’s ability to learn. Unfortunately, the expensive vision therapy that is so often recommended to treat CI does not always deliver the results that parents hope for. Between 3-5% of all people have CI. However, it’s extremely rare to see in children under the age of 10. Convergence Insufficiency is caused by weak neuro-muscular connections. Dyslexia, on the other hand, is a brain-based learning disability. CI can lead to lower achievement in school, but it is not a learning disability and it cannot cause dyslexia. 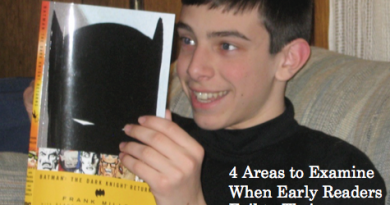 So, how do you know if vision therapy is going to help your underachieving kiddo? 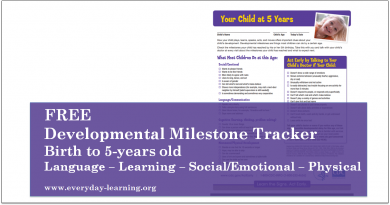 Well, the first step is to figure out if your child has a reading disability (they can’t seem to remember how to sound out words) – or if they have a problem with reading (they get distracted when they try to read)? Reading disabilities are neurological in nature. For some reason, the person’s brain just does not remember the phonics skills they have been taught. Sometimes the breakdown is in remembering the individual sounds that letter combinations make up. Other times, the dyslexic child has learned those phonics skills but they just can’t seem to pick up the speed in piecing it all together. Having a problem staying focused on a reading task, on the other hand, can actually have multiple causes. For some children, ADHD may cause their inattention or distractibility and a pediatrician could prescribe medication to help. 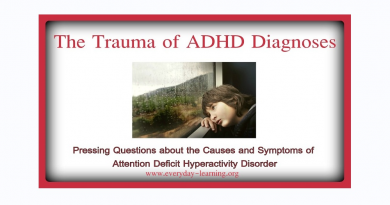 For other children, they may have an undiagnosed learning disability so what looks like distraction may actually be avoidance so they don’t feel bad when they fail at their lesson. In this case, specialized instruction would be the best treatment option. For children who actually have Convergence Insufficiency, the distractible behavior is linked to the visual system. Trying to read the words that they know is literally a tiring and painful task for these kids. CI can result in headaches when a person tries to read for a long time – which may cause some people to avoid reading altogether. Just as a person may go to the gym for strength training in their legs to help build up stamina for a long hike, treatment for CI involves training the eye muscles to work together to stay focused. 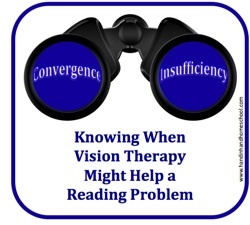 Vision therapy cannot cure CI, but it help make reading an easier task. Generally speaking, if your child is not experiencing improvements after 4 weeks of vision therapy, then there’s a good possibility it is not the correct treatment for your child’s reading problem. This blog post is part of the HoagiesGifted May 2015 Blog Hop. Visit Hoagies’ Blog Hop home page to read more about twice exceptional children, written by other professionals and parents of gifted kids. Has your child been diagnosed with Convergence Insufficiency? Has vision therapy improved their academic achievement? I never thought that eyesight could be a problem to reading. Vision issues can definitely be related to reading problems. Headaches and blurry vision can cause anyone to avoid reading – which can lead to learning and achievement problems when kids are still acquiring basic reading and comprehension skills. In the case of convergence insufficiency, the person usually does not have a learning disability because more often than not they can sound out words fine. The problem is generally that they cannot sustain focus on the text long enough to actually read it. In a case like this, strengthening those eye muscles through vision therapy or even prism glasses is what help solve the reading issue. This is really interesting because we keep hearing about vision therapy and I wonder if it’s really worth the money. This gives me some things to think about. Definitely lots of questions to consider. 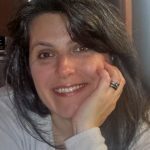 I hope you’ll take some time to read through some of the other links. Feel free to be in touch if you need more help. What a fantastic post! When I worked a school psych, this was always a major issue. Vision therapy can be expensive. So great to tease it out more. Thank you! Thanks, Cait. I work with a fantastic vision specialist who helps our clients sort out when vision therapy might be appropriate choice and when other remediation efforts are the better option.